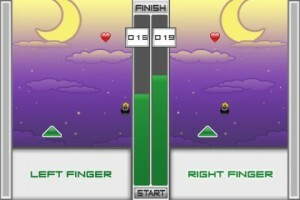 App Review: Parallelus-Can You Play Two Games at Once? Parallelus by InnerPlays is a fun game that will certainly teach you how to multitask. Your job, as the player, is to try and guide each of the two triangles through a series of falling objects. To control the triangles, you put your finger in the designated area below each triangle. There are two types of objects that you must deal with. The first object is a heart, which you want to collect with your triangle. The second, is a bomb, which you want to avoid. There are three game modes in Parallelus. These modes allow you to play with hearts only, bombs only, or both. There are 50 levels in each of these three modes. The levels will continue to get longer and harder the longer you play. After completing a level, it will show you your stats for that level. It tells you how many times you moved each finger and how good you did at avoiding bombs and catching hearts. To view the averages for all of you stats, just go to the main menu. Parallelus is a fun and chalenging game that takes fast reflexes and quick thinking.